And hurrah for me. Looks like it’s been a week of wins. 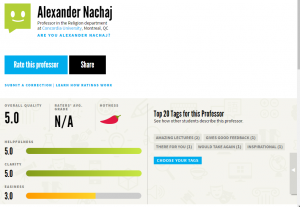 Anonymous teacher review website “RateMyProfessor.com” finally has some reviews for me after my first semester of lecturing at Concordia University. And it looks like I earned the mother of all recommendations: the chili pepper. The joke is that even though the site keeps track of comments, description tags and rates the professor based on helpfulness, clarity and easiness, the real challenge is whether they get the “hotness” rating. Hopefully this will translate to more sway within the department and more classes heading my way. So what if the class topic isn’t the main draw for students. we want to fill seats don’t we?